As many members of the UNC-Chapel Hill family have recently learned, you can try to put your past behind you, but that doesn’t mean you will it successfully. Former UNC-CH men’s basketball player Rashad McCants, a prominent member of the 2004-2005 national championship winning team, told ESPN’s “Outside the Lines” that tutors wrote his term papers and he rarely went to class, filling up his schedule with bogus and easy classes to keep him academically eligible, such as those in the Department of African-American Studies that many UNC-CH football players took. To make matters worse, McCants added that head basketball coach Roy Williams was completely aware of this system. For a UNC-CH athlete to say these things is not only shocking, but harmful to the University’s reputation, especially coming off the heels of the Mary Willingham debacle. And for that athlete to be a basketball player, a member of UNC-CH’s leading contribution to both college and professional athletics, may prove that Carolina does not care about having a strong public image as long as their teams are winning games. If these claims prove true, Coach Williams commitment to this University’s academic integrity and his position as head coach of the basketball team should be questioned. If they prove to be false, Williams should sue McCants for extreme defamation of character and libel. With all of the opposition mounting to McCants’ claims, it seems that the obvious course of action would be to conclude that McCants is lying. However, I’m honestly not buying either side on this. In regards to the integrity of McCants, his past portrays him as someone in want of revenge. McCants was an extraordinary player for Carolina, leading the ACC in scoring in the 2003-2004 season. That does not, however, make him an extraordinary man. He has a poor relationship with Williams, and is on the record blaming Williams for his lack of performance in the NBA as early as 2011. On top of that, McCants’ evidence does not add up. In a 2004 story by the Associated Press, the author notes that McCants had little to no free time due to the amount of time he spent practicing and studying. Then there are comments from other individuals like former NC State star Julius Hodge calling McCants a “nut job”, and encouraging people not to believe anything McCants claims is fact. With these facts in mind, McCants claims should obviously be held to a very high level of scrutiny. Even if they are partially true, it is likely that they are greatly exaggerated. Despite reaction against him, McCants has found a strong ally in U.S. Rep. Tony Cárdenas, who in April questioned whether the NCAA failed to hold UNC-CH accountable during their school 2012 academic fraud. On Friday, Cárdenas, a Democrat, met with McCants to learn more about the NCAA’s possible issues concerning the relationship between education and athletics. The integrity of Mr. McCants is something that will have to be explored in further independent investigations into the University’s athletics programs. However, Mr. McCants’ questionable integrity does not imply that Carolina is innocent in all of this. After years of still trying to overcome the Butch Davis/Holden Thorp episode and trying to avoid Mary Willingham like the plague, it would be naive to start trusting the University’s version of the story just yet. Yes, replacing those who did harm to the University’s reputation was a step in the right direction, but trust is not something you can just replace with ease. It has to be built overtime, and frankly UNC does not deserve anyone’s trust on this issue anytime soon. In addition, University records note that in the year the men’s basketball team won the national championship, basketball players accounted for 15 enrollments in classes offered by the Department of African and Afro-American Studies. Some might say, that independent studies UNC-CH pushed have already noted all of the school’s wrong doings. The problem with those studies is that they only went back to 2007, so they may have failed to properly analyze all of the University’s problems. Carolina needs to take McCants’ comments into serious consideration and find out to what degree these claims are true. On a somewhat weak closing note, in my October 2013 piece about the lost UNC-NC State rivalry, I mentioned that the rivalry fell apart after NC State’s men’s basketball team was dealt a heavy blow after the NCAA found the program in violation of numerous rules. 1983 championship winning coach Jimmy Valvano resigned, and NC State fell from prominence as Mike Kryzewski and Duke became the new kid on the block to challenge UNC-CH’s standing as a basketball powerhouse. 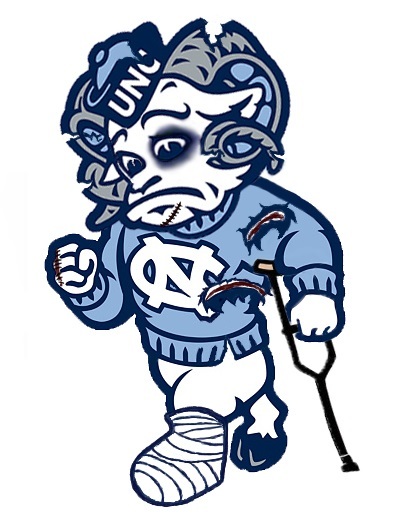 So, if UNC-CH is dealt a major blow and loses prominence as a program, at the least there will be a chance to rekindle our relationship with NC State by watching two mediocre teams try to see who would play second fiddle to Coach K. That would be fun, right? A very sensible and sober assessment. As a retired faculty member (and former advisor to the Carolina Review), I’m pleased to see that some UNC students are paying attention to this mess and not jumping to premature conclusions. Keep it up.